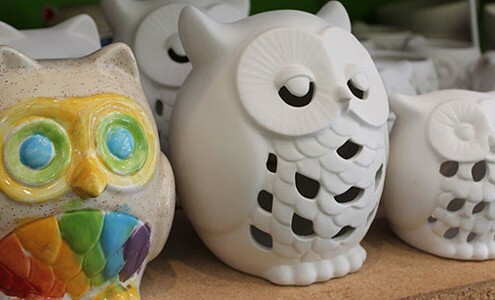 Want to paint pottery? It starts with the bisque. “Bisque” is the stage that the pottery is in when it’s ready to paint. We have over 150 different pieces of bisque, including 5 styles of dinnerware and various shapes and sizes of platters. We also carry mugs, bowls, vases, tiles, chip and dip trays, banks, figurines and just about anything else you can think of. All ages and abilities are welcome- you don’t need to be an artist to paint but we will make sure you will leave feeling like one! Relax and let your creativity flow. We have an endless palette of colors to choose from. Browse our studio for inspiration. We provide patterns, stencils, stamps stickers & tracing paper. Water-based marker disappears during the firing process, so you can draw a design. We provide patterns, stencils and stamps. Our creative staff is there to provide tips and techniques. Ask us, that’s what we are here for! Choose your bisque, something functional or fun! 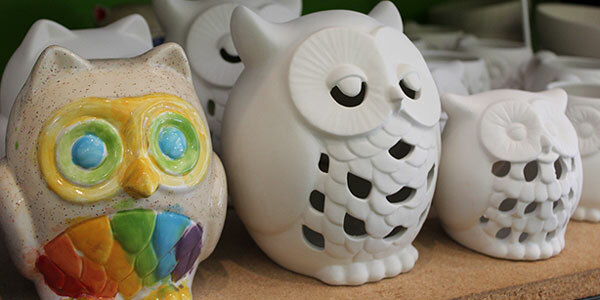 Leave your finished piece with us, we will glaze & fire it. We will give you a call in 7 days when it’s ready for pick up. After firing, your finished piece will be completely food safe and functional. To preserve your piece for years to come, we recommend handwashing. In a time crunch? We have several options for you! Rush Firing Fee $12 = We can get your piece fired in as few as 3 days! Take It & Bring It Back = Paint your piece in studio, bring it home to present & then bring it back for firing! Acrylic Painting = For fun pieces like banks, figurines & frames (non-food pottery), you can paint it with acrylic paint & take home the same day! 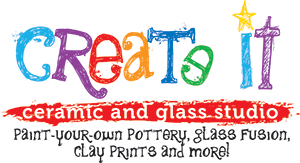 Prices vary but include all your studio time, paint, materials, glazing & firing.